Frugal and Thankful: Food waste and a menu, week 4/21-4/27. Food waste and a menu, week 4/21-4/27. Luckily, Sunday was quiet and uneventful. We had a great time with the family and got an enjoyable break from a busy life. And what's on your menu this week? I have lived in the eastern and southern US all of my life where earthquakes are not common. However, I was in my first one a couple of years ago and it was unsettling. That one sounded like a big boom and I thought that there had been an explosion somewhere. A year later, we had another one that was larger. That one you could feel the shaking and things were falling off of shelves and caused damages to buildings. Despite the beauty and good weather, I do not want to live in California. Yum. Grilled Zucs has to be one of the best looking and great tasting items I never even knew existed until the last few years. I remember the first time I tried it, and believe me, I as hesitant, but yum! That photo does do it a bit of justice, and it's beginning to look a lot like summer! PS: I am fairly certain I also have a sad bag of spinach that needs to go to compost heaven... I underestimated how long it'd take me to eat regular food again after getting my wisdom teeth out. Okay- after reading your post all I thought was "Wow." Wow to your BIL's car accident! That must have been really scary. Thank God they are alright. And Wow to the earthquake. We have had little ones here too and it is frightening. 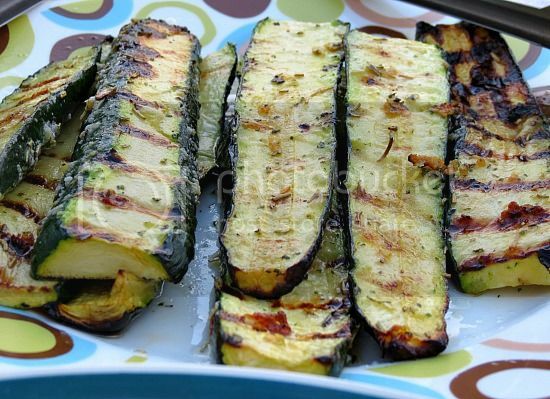 And Wow to the grilled zucchini- that looks delicious! Wow, those grilled zucchini look amazing. I have never tried grilling zucchini before, I'm inspired to give it a try! Zucchini are a reminder to me that summer is on it's way and soon I'll be picking those out of my garden. Thanks for your blog. Love it!